Disclaimer: This information is based on the process I went through as a United States applicant in 2014-2015 to obtain my Z Visa. This guide is *not* legal advice, and it may not be up to date. Visa regulations change frequently, without warning. Check in with your Chinese consulate for the most up to date advice. Yes, it’s that time again, folks! 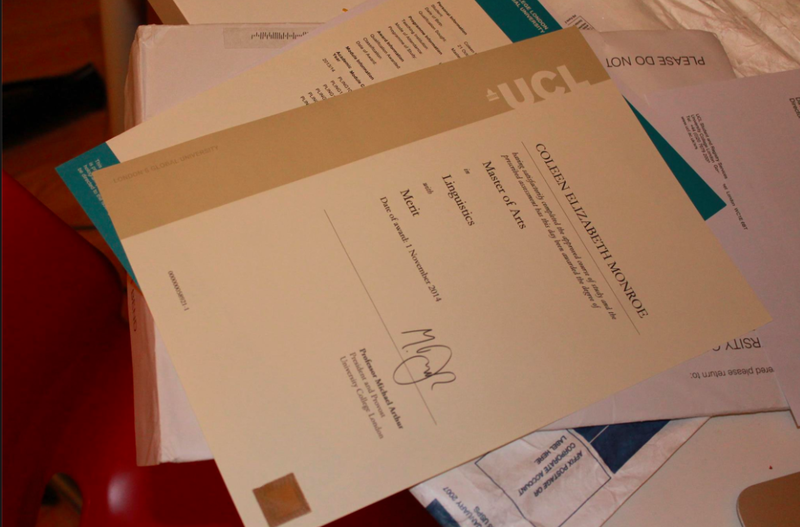 Time to attempt another international migration, and time to apply for another visa. 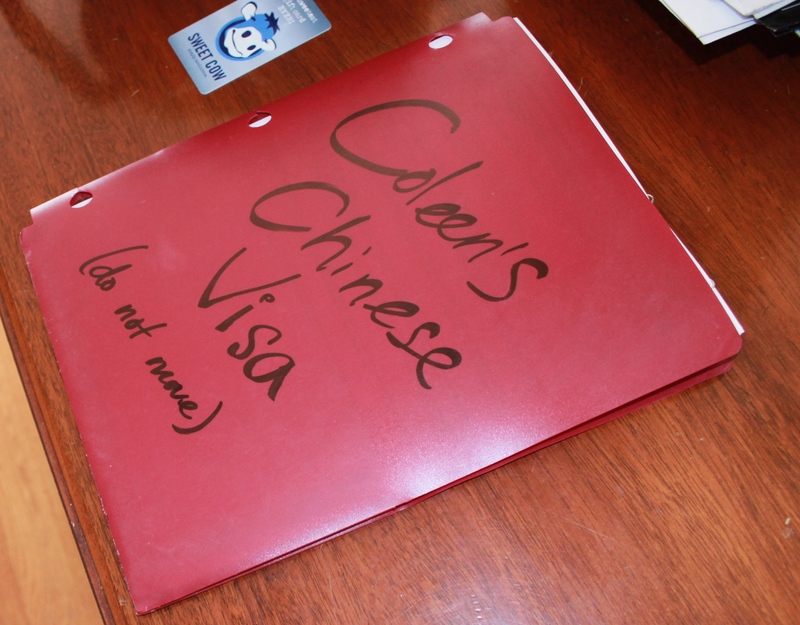 This time takes us to China, with the Z visa for work. We will be living in Shanghai, teaching English in an academy. The process has to start early, as it does for all visas. For Korea, it took me 118 days to obtain a similar visa (the E-2 English Teacher’s visa). This one’s shaping up to be similar, but some of the early documents were gathered last July, before we had a job offer or were married! Prepare early, and make sure you use good habits to keep yourself organised (and sane) during the long process. Contact me below if you have questions. This is going to be stressful. 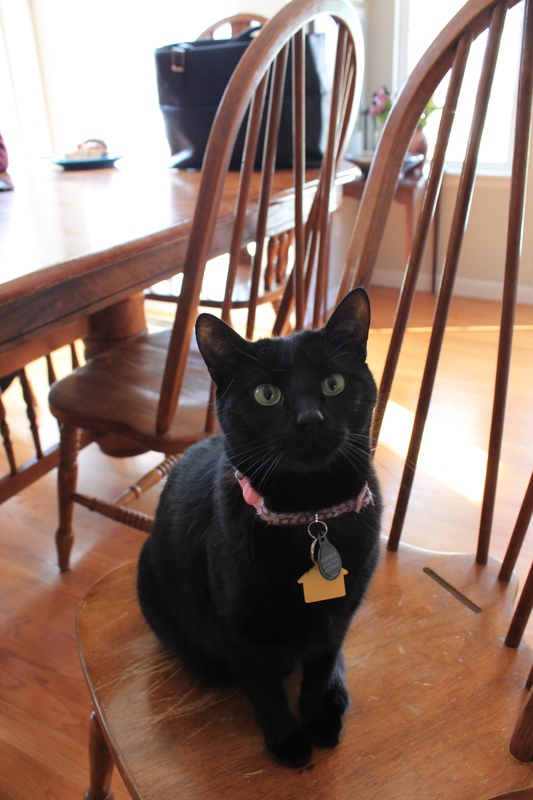 Here’s a kitty. This process is more relaxed and can be done ahead of time. You should begin gathering these documents at least six months before you intend to arrive in China. A professional picture of yourself. This should be a headshot with a neutral background, with a big smile and professional clothing. Some recruiters may ask for a health check to be submitted. In my experience, this was not necessary and might be duplicated once you reach China. It can also be very expensive. Check with your recruiter/employer. Find stuff to keep you occupied while you wait for the documents. I find that crocheting and planning a wedding are great pastimes. Once you have your FBI check and the other documents, get started with interviews and really push to apply to a bunch of schools. We had several interviews over the course of a week, all over Skype. Once you obtain an offer and confirm it, you can move on to Step 2. BEWARE: If a school says that you should come over on a Tourist or Business visa instead of a Work Visa, run away! They might not be committed to bringing you legally into the country. You could be personally liable for immigration mishaps, and face criminal charges or deportation. Time to put it to use. This part took a long time, but that’s what you expect when it comes to letters for visas. You will need to submit documents to your employer in China, which they will then submit to local authorities for approval. This is the list we submitted to our employer, but always check with yours. Chinese authorities are extremely strict about formatting. Be precise! A scanned list of at least two contactable professional references. Anything else requested by your recruiter or employer. For example, we completed a second background check through a private company. 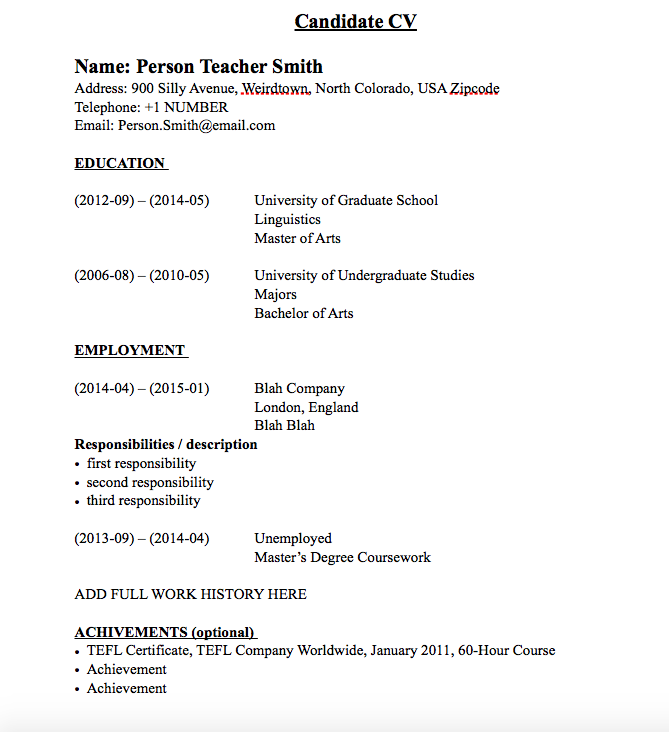 Example CV- Don’t misspell achievements like I just did. None of these documents can have any part of the scan cut off or blurry. Get familiar with the settings on your printer, or just have a professional do it. Check whether your documents should be sent as a .pdf or a .doc!!!! Once you submit these documents, your employer will begin the process to obtain a Work Permit and Letter of Invitation. In our case, this process took 46 days. You should be a professional relaxer/crochet fiend at this point, so use those skills to fill the time again until your documents arrive. You may have to wait a long time for your documents to arrive. In the meantime, familiarise yourself with the visa application process for the consulate with jurisdiction over your home state. Every consulate’s process is different! Some require documents that the others do not. I lucked out, because Chicago seems very straightforward. In almost every case, it is recommended that you use a visa agency to apply. 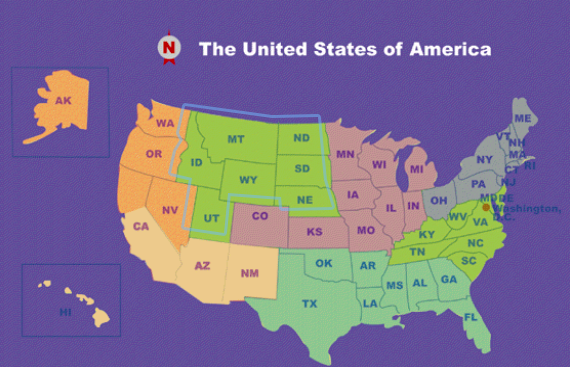 Do research on the agencies in the area of your consulate. Save as much money as you can during this waiting period; you will need a reserve of several hundred dollars to apply for the visa, and you might need to buy a plane ticket if they call you for an interview (rare, but possible!). Keep in regular contact with your recruiter, and do the other things you need to get ready to move to China. Get an eye exam. Renew your birth control. Eat as much cheese as humanly possible. You know, normal things. Gods of immigration willing, your official Work Permit and Letter of Invitation will arrive without issue. Be certain that you are prepared to submit the application as soon as they do. Follow the instructions from your visa agency to the letter. Attach a professional passport photo to this form with a PAPERCLIP. DO NOT STAPLE. Your agency may ask you for additional documents. These could include proof of address, a photocopy of your diver’s license, additional forms, or a plane ticket. The above documents were for my submission to the Chicago Consulate. NOTE: Don’t ever send visa documents, for any country, in the regular mail! Always use FedEx, DHL, or another courier and always get the tracking number. Step 5: Receive Your Visa, Rejoice, and Prepare to go! I’ll update this section once I’ve got the visa in hand next week. UPDATE: Visa is in hand. 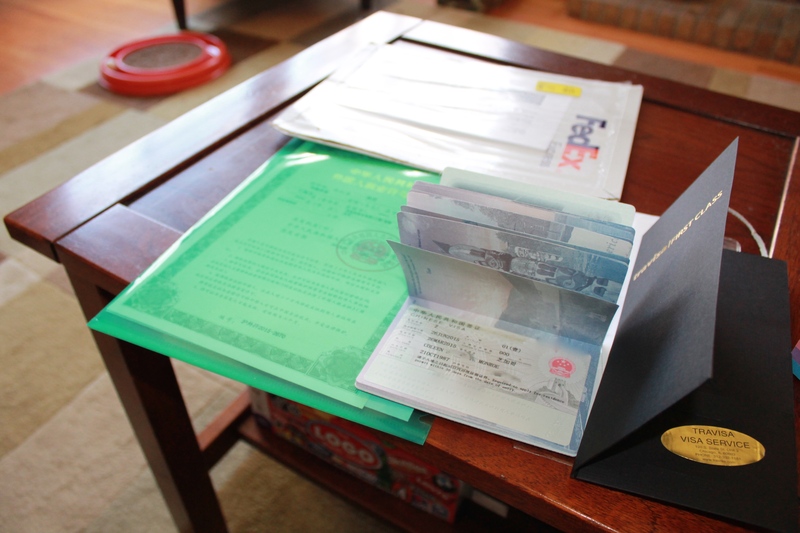 Make sure that you also get back your work permit and letter of invitation originals so that you can go to China. I definitely recommend the First Class services from Travisa. They handled this so well, and made sure that I knew what was going on every step of the way. Worth every penny. Then with my current employer from February 2015 to till now which will be 1 year 10 months. Can this create a problem regarding 2 year full time work experience.? And also what should I mention for the 2 months gap between employment.? It depends on what your visa sponsor requires as well. Are you applying to work in Shanghai or elsewhere? If there is a gap in employment make sure you cover it with something official sounding in the resume section. For example, I wrote “travelling and volunteering” for one section. Just dont leave it blank unexplained. My current company wants to move me to their Branch in Suzhou, Kunshan. For 5 months I was studying while I was working so these dates will overlapse .. But I also have work experience letter for this period. So is the 2 year full time work experience different from Suzhou, Wuxi, vs. Shanghai? Is it a new requirements? @Rahul, did it work out for you? I believe that the requirements are the same for most of China (two years of full time experience), but you would have to contact a Chimese consulate. Bear in mind that the rules may have changed since we applied back then. I agree with Coleen, the requirements are the same for most of China (two years of full time experience). And That should be after your graduation. Internship or Graduate trainee experience will not be considered.